Bread pudding!! Yes, please! I love bread pudding! (And exclamation points!) Oh dear, I can't stop! So excited! Let's get started! Hold the phone. I have to make bread for the bread pudding? What the? I thought I'd just have to get a loaf of bread. Well this changes everything. Yes, everything. (If everything is this recipe.) In my day, we made bread pudding with a loaf of day old bread. Sorry, I just had a birthday and I think I may have hit the 'I remember when' age. Why we used to have to walk a mile uphill to get a loaf of bread. Sorry...again. Let's get started for real now. 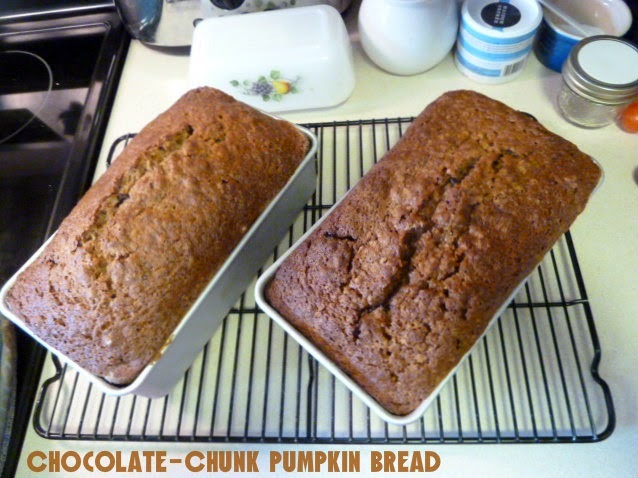 So, step one: Make a chocolate-chunk pumpkin bread. Cake release. Can't get enough of that release. Bread needs it too. Don't judge my baked good's needs. This is another quick bread, no mixer required. And in no time, it is ready for the oven. This bread is delicious. So delicious! I just didn't imagine having to make a quick bread to make bread pudding. It is almost too good like this, to do anything with it. (Well, other than eat it.) That's why I made two loaves! Super genius. Step two: Make the bread pudding. The second loaf gets cut into chunks and toasted in the oven. 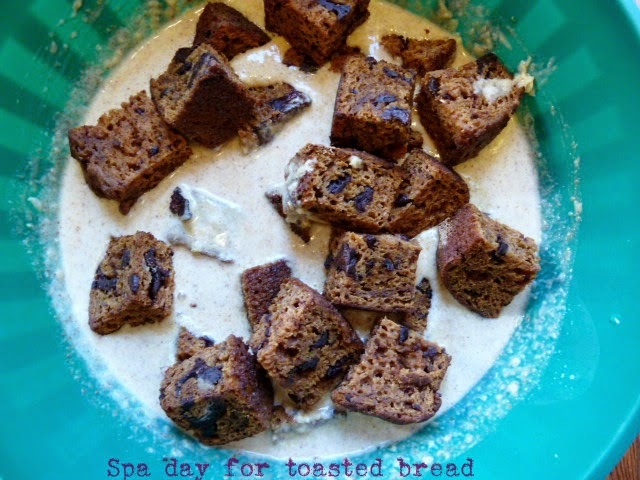 Once toasted, the chunks of bread get into a bath of cream, eggs, pumpkin and sugar and spice and everything nice. Look Madge, I'm soaking in it! After a half hour of soaking, the mixture is ready to be poured into a pan. A few of the toasted bread chunks are saved and covered with melted butter...which then get tossed on top of the mixture. A little vanilla ice cream on the side is a perfect partner with this bread pudding. It was good, but I think I'd be happier with it in loaf style. It really is a good bread on its own. I do love the pumpkin flavours though. Perfect fall weather eats. But it isn't fall yet...I'm looking at you Starbucks...and all the other coffee shops. As much as I love a pumpkin spice latte, I feel now is just too soon. At least wait until the first day of fall! I mean really!! (This rant brought to you by Old Lady Cranky Pants.) Don't get me wrong, I might will have one of those lattes before fall. What? I'm only human! For the recipe and to see how everyone else liked this recipe, visit Baked Sunday Mornings. I too, was like I have to make my own bread? But I loved the bread and the pudding. I'm definitely going to check out the cake release . How do you like the chocolate chopper gadget? I love my chocolate chopper! I find it so much better to use, than a knife. I love the look of your chocolate chunks -- much prettier than chocolate chips (for those of us like me who took the lazy route!). And you're right, so long as you like the way it tastes, what else matters? Ooh, what a great addition of chocolate chunks!